With Minor League Baseball starting last week, let’s take a look at where the top prospects of the Philadelphia Phillies began their seasons. In a shocking move, the Phillies not only promoted our top ranked prospect, Scott Kingery, to the Major Leagues, but they also signed him to a 6-year contract. He’s proving to be a valuable asset, playing all over the diamond and starting games at 2B, 3B, SS, LF and RF. The team is doing everything possible to keep his bat in the lineup. The team’s top pitching prospect, Sixto Sanchez, is starting the year at Single-A Clearwater. The 19-year old was slow to get moving because of the flu, but he’s ready to further continue his development this year. He was throwing hard but had a rough outing, giving up 4 earned runs in 4 innings but he did have 6 strikeouts. Our #3 prospect, J. P. Crawford opened the year as the Major League Team’s Opening Day Shortstop. He has started slowly at the plate with only 1 hit in his first 23 at-bats but is turning the corner. He’s showing good defense and started slow last year so there is hope for him. He has recently come around with his bat, with a home run against Chris Archer last week. Franklyn Kilome, our #4 prospect, is in Double-A Reading starting the year. He had a rough first appearance but he was pitching in the snow and was pitching under-the-weather. He is on the 40-man roster so there is a chance we could see him in the Show later this season. Our #5 prospect, Jorge Alfaro, began the year as the team’s starting catcher. He is showing a great arm behind the plate and has showed an improved approach behind the plate. In 24 at-bats as of this writing, he has 3 walks, compared to 3 walks in 107 at-bats last year. The team designated last year’s starting catcher, Cameron Rupp, for assignment (already claimed by Texas Rangers) which showed the team’s faith in Mr. Alfaro. Ranger Suarez started the year with Double-A Reading Phillies. The 22-year old is in his first year above Single-A and is looking to continue the success he’s had in the past that made him our #6 prospect. My favorite prospect this year, Jhailyn Ortiz, started the year with Single-A Lakewood. He went hitless in his first 16 at-bats but got 3 hits the next two games. Our #7 prospect is looking to build on his successful 2017 where he hit .302/.401/.560 with 8 home runs in only 159 at-bats. Our #8 prospect, Adam Haseley, starts this year in Single-A Clearwater where is is looking to continue to show his solid all-around hit-tool. Kevin Gowdy will miss all of 2018 after having Tommy John Surgery in August 2017. I look forward to seeing what our 9th-ranked prospect can do when fully healthy. Roman Quinn started the year at Triple-A Lehigh Valley after having a strong spring leading the Grapefruit League with 9 stolen bases and producing a slash line of .268/.375/.341. He also played SS in addition to Outfield to give him more options to get to the Show. He’s #10 on our Top-50 list. #11 Nick Fanti – The left-hander is on the DL for Single-A Clearwater to start the year. #12 Seranthony Dominquez – The hard-throwing right-hander was moved to the bullpen this year and is presently pitching very well after a rough first game for the Double-A Reading Phillies. #13 Francisco Morales – Opened the season in extended Spring Training. #14 Adonis Medina – The darling of Phillies prospect enthusiasts (myself included) is looking to take the next step this year starting out at Single-A Clearwater. #17 Darick Hall – The 1B is in Single-A Clearwater and hit 2 home runs in a recent game continuing to show his power. #18 Mickey Moniak – The former 1st overall pick in the 2016 draft is in Single-A Clearwater trying to show the potential he had coming out of High School. #19 Dylan Cozens – He’s back in Triple-A to start the year looking to recapture the hitting tool that catapulted him to 40 home runs in 2016. He’s off to a good start with 2 home runs in 25 at-bats as of this writing. #20 Enyel De Los Santos – The acquisition from the Padres for Freddy Galvis is looking good at Triple-A and could be a candidate – The former 1st round pick in the 2015 draft is in Double-A Reading to start his year. #22 Jose Gomez – Single-A Clearwater as of now. Gomez shows a good eye and has some speed. I look forward to watching him develop. #23 Spencer Howard – Single-A- Lakewood fans are watching Howard average 21k/9. Alright, it’s 7 strikeouts in 3 innings pitched but it’s still a great start. #24 Yacksel Rios – He is currently pitching in relief for the Phillies and got his first Major League win on April 11th. He’s an intriguing player to look at, especially in fantasy leagues that count holds since Gabe Kapler uses that bullpen alot. 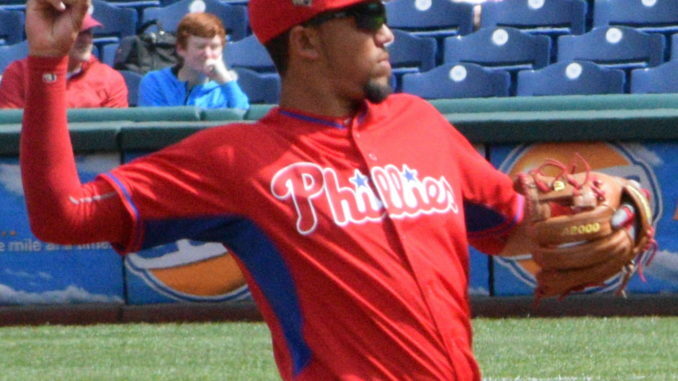 #25 Elniery Garcia – After being suspended for PED use, the Phillies have him at Double-A Reading to start his year. #26 JoJo Romero – Starting in Double-A Reading after a great 2017 there. #27 Victor Arano – He made the Major League roster after showing some potential during Spring Training. So far in 4IP, he has struck out 5 batters and has a 0.00 ERA and 0.00 Whip. #34 Deivi Grullon – The defense-minded Catcher is in Double-A Reading. #39 Ricardo Pinto – He was designated for assignment then traded to the Chicago White Sox for international signing bonus pool money and assigned to Class-A Winston-Salem. #41 Luke Leftwich – The hard-throwing reliever is in Reading Double-A to start his year. #48 Arquiemedes Gamboa – Clearwater-Single A+. The more I read about him, the more excited I get about his potential. I’m hearing more and more about Ramon Rosso, especially after he struck out 12 over 5 IP (!) just last week for Lakewood. What’s your take on him? Would he jump into a Top 50 list if it were to be re-done today? Hey BJ, thanks for reading and the question. I would think he forced himself into top 50 consideration even after only 5 innings. Looking at his past statistics, he has averaged 12.9 strikeouts per 9 innings. Pretty impressive. I’m looking forward to seeing how he continues to develop this year. This team does have some pretty good pitchers in their system, don’t they?